I just came back from the Easter holiday from Romania. I spent there, two lovely weeks with the family and friends. I have visited so many people and I was invited for their rich and tasty meals. In Romania, bread is something that cannot miss from a festive table. Lovely food, but ... because there is a but ... I missed something very much... I miss my breads. As weird it can sound, it was impossible for me to taste any of the bread was given to me there. All the bread was of course bought from the shop as nobody really has time there to make it. The bread was nicely raised with an impressive white crumb but when tightly taken in the hand it was becoming like a tree bark. The crumb was disappearing between the 2 crusts. I've tried it, ate a bit and let it on the table. I simply could eat anymore this kind of bread ! It was tasting and looking like pressed paper. So for 2 weeks I was bread free. 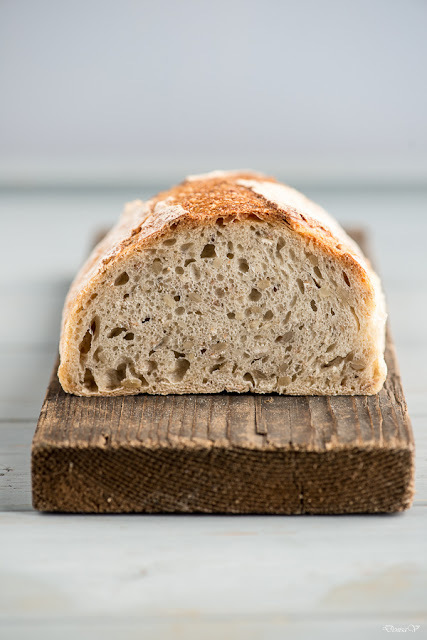 Coming back, I had only one though in my mind and that was to bake and eat again my sourdough bread. How I was in serious lack of time to inspire from other sources I have just thrown in the bowl the ingredients for this bread. I made 3 beautiful loaves and brought one of them to my nice neighbour. I don't have to say that this bread, after 2 weeks of bad bread, was tasting to me as the most incredible bread in the world. And I thought that it was because I have missed my breads so much until my neighbor came back to me with the feedback that he has been eating the bread bear, with no additional food on it, as it was impossible to stop biting from it. With this, I thing requires no more presentation from me. 8:35AM Mix all ingredients together for 15 minutes. 8:50 AM Cover the bowl with a lid and let it stand at 20ºC for 4h30. This is the bulk fermentation phase. 13:45 Put the dough in bannetons and cover them with a linen towel. Let them stand at 22ºC for the final fermentation around 1h30. 15:10 Turn on the oven at 260ºC with the baking stone inside and volcanic stones in a pan under to help creating steam. 15:55 Score the loaves with a blade and put them in the oven on the hot stone. Bake them for 15 minutes keeping the same temperature. After these 15 minutes, reduce the temperature to 220ºC and continue to bake for another 30 minutes.